What is PPSR and How does PPSR Search/PPSR Check Work? The PPSR will show up in search results when you are trying to find out information about REVS Check or how to get the history of a used car. But, what does PPSR have to do with buying a used car? That’s what we look at in today’s post. 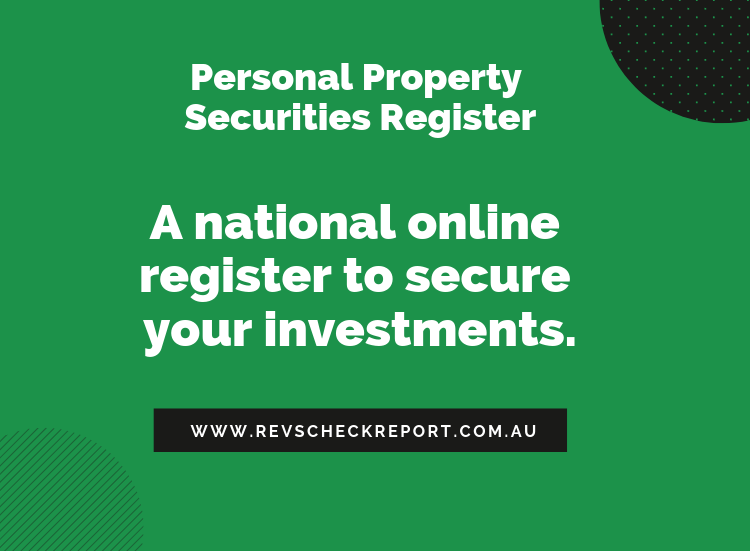 The Personal Property Securities Register (PPSR) is used by individuals and companies alike for protection when buying personal property. It is a way to protect consumers from buying encumbered vehicles as well as getting write-off details on a car. The PPSR is also so much more than that in that it pulls data from NEVDIS to let you know the registration details of the car and whether it was reported stolen. So, a PPSR search is a great way to protect your investment in a used car by preventing you from making an expensive mistake. Imagine that you want to buy a used car. You search and eventually find a car that you like. Everything looks good. The car looks OK. There doesn’t seem to be any issues. The registration papers seem to be in order. You’re ready to go. You pay for the vehicle and drive off. You get pulled over by the police. The registration is expired. You now face a fine and penalties on your licence for driving with an expired registration. A month in, you realise that the seats are damaged and need repairs. The mechanics says it looks like the car was flood damaged but never restored properly. You end up paying hundreds if not thousands of dollars on damage repairs. Then, a month later, you wake up to bailiffs at your front door about to take off with the car. They show you a PPSR registration indicating that there was a loan on the car and the owner of that loan is exercising their right under the PPSR to collect the car lieu of non-payment from the previous owner. Your neighbours think that you weren’t paying your car loan, and that’s why it’s repossessed. But you had bought the car using cash, and now was out of cash and your car. Now imagine if there was a way to have checked all this information beforehand and prevented the loss of funds and the embarrassment of being awakened by bailiffs. You don’t have to imagine it. It’s already here and it’s the PPSR. And that’s why you should do a PPSR check before buying a used car. You can do a PPSR search online by two methods – the rego number or the Vin number. PPSR search by registration number is one of the ways in which you can run a PPSR check. The rego number is the numbers and letters assigned by the state as the number plate of a car. You can use this rego details to search online once you know the state in which the vehicle was registered. The other way that you can do a PPSR check is by a PPSR search by VIN number. VIN is the Vehicle Identification Number that is unique to the vehicle. If a VIN is associated with more than one vehicle, you need to have it check before even thinking about buying the car or motorcycle you were eyeing. Finance check is for showing registered interest in the vehicle. This tells you if the car is encumbered and whether the owner owes money on it. Vehicle finance check free is not an option. But, you can get it at a low price at REVS Check Report. Learn if the vehicle or the engine had been reported as stolen, so you can make your independent checks with the local police to verify the details and recovery. Make sure that there were no damages that may end up costing you in repairs. Or you end up with a lemon due to all the faults stemming from damages and accidents not reported by the owner to you. If you plan to buy a used car, then you should definitely run a PPSR check on REVS Check Report. Get a detailed car history report and an official PPSR certificate with your PPSR search.